That looks like a neutral Fed to me, delivered straight from Santa to the markets. Under pressure from the United States demands to reform its economy as part of the trade war, China is rushing through a law that would offer more protection to foreign companies, business leaders have said. The Foreign Investment Law of the People’s Republic of China (FIL), claims to “further expand the scope of opening-up, to actively promote foreign investment, to protect the lawful rights and interests of foreign investment”. It covers many of the items on the wish list of reforms released by US President Donald Trump after his summit meeting with Chinese President Xi Jinping in Buenos Aires in December, including forced technology transfer, intellectual property protections and the safeguarding of foreign companies’ capital. On the whole, the law pledges “equal treatment” for foreign companies operating in China, but reserves the right to a “review of foreign investment that affects or may affect national security”. The draft law is viewed as an attempt by China to avoid an escalation in the US tariffs placed on US$250 billion of its exports, which are due to rise from 10 per cent to 25 per cent on March 2 if Washington’s demands are not satisfied. Is it enough to change my view on wider global dynamics? In the short term we’re clearly now in a Fed-led reflation rally with some kind of trade deal increasingly likely. But I still see it as counter-trend for the USD, EUR, CNY and AUD. The Fed has done its bit to stabilise global conditions but the others have not yet and will need to do even more. That ought to support the USD before long. Yeah the problem is that our beloved Aussie is now an ugly old whore, she so hard to love but that often has us forgetting that trade in this whore house is relative rather than absolute. After a few stiff drinks and a good look around the establishment our old Aussie doesn’t look half so bad. How many more drinks before she starts to look good? So that would almost have us 7270. On the contra we can anticipate ugly christmas data, presumably more signs of a government in exit mode – though presumably both government and opposition in spend mode for election would be stimulatory. The AUD would presumably spike even if the Hayne RC was less damning on banks (and their lending) than forecast. Fed obviously worried about something they are not telling us. Look at that bond market especially the 5 year. Some of the main real estate markets coming under pressure now. So….what is happening to house prices in Southern California (e.g.) determines the future of manufacturing and farming in this country. Even further it determines the economic and social structure and the distribution of income and wealth across Australia, between Sydney and Melbourne vs the productive regions, and between producers and consumers. I am constantly amazed by the wisdom and clarity of thinking displayed by successive governments, Treasury, RBA and Economics faculties across the land. I mean sreiously. If you wanted to pluck this country could you have designed a better economic policy meme? Give global money managers control over our economic destiny? sounds planned. Another form of privatising the commons. There was a time when I’d laugh at Furfine Algorithms. Than I went through a period where they made me cry. These days I prefer to just profit from the mistakes / misunderstandings of my betters. I hope that puts an end to the moronic notion that the value of the A$ has anything to do with Australia or what might be good for Australia and its people. Ain’t what passes for economic thinking in this country wonderful!!! Dovish Fed! Who would have thought? 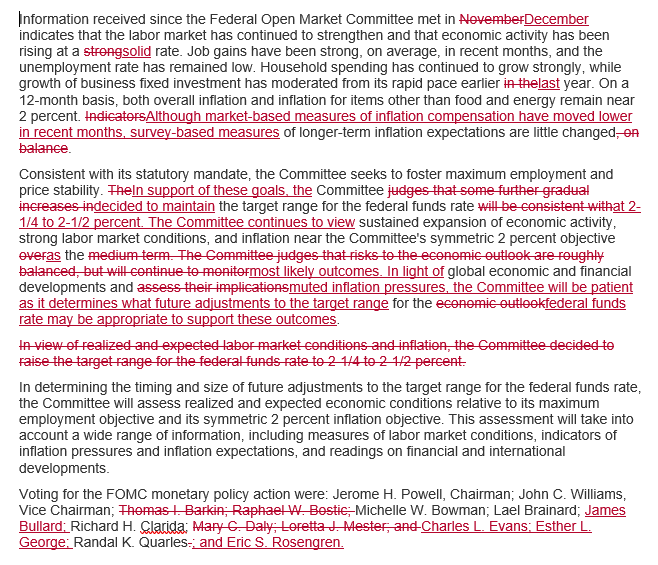 More proof that the FOMC are nothing but a gathering of empty suits. The financial markets are firmly in charge of monetary policy, so why pretend otherwise. When markets don’t like something they hear they behave like a petulant child and the pandering parent (FOMC) comes running, armed with sugar. Okaaaayyyyyyy! What grows on pure sugar? There’s going to be lots of it around. And why not … they have taken mostly what they need and now they crow they have leading-edge technological advancement. That said, they are masters at pulling the rug and ensuring their own State-owned/controlled companies maintain being, or heading to become, the world biggest. I’d expect that even in the brain deadening environment in central Sydney it is starting to seep through that things are not all ok. So last week was about what? Fiddling with perception so that the A$ held up without them actually doing anything? Yup! – or Draghi! We have allowed ourselves to become just a cork on a very big ocean.